A Super Durable Polyester powder coat finish is electrostatically applied in our state of the art paint facility. Standard colors available: Black, Bronze, OD Green, White. Custom colors available upon request. Made with a state of the art UV stabilized acrylic high performance refractive optical assemblies that use high transmicity materials to achieve precise photometric distributions. Available in NEMA 2x2, 5x5 and 7x7 beam configurations. NOTE: A TECHLIGHT SURGE PROTECTOR MUST BE INCORPORATED INTO THE LED SYSTEM AT THE BEGINNING OF EACH CIRCUIT AS A MINIMUM. FAILURE TO DO SO WILL VOID THE SYSTEM WARRANTY. Fixture operates at 120V input voltage. Nominal open circuit current .37 amps. 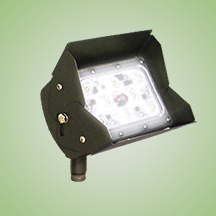 A 44 watt LED source provides approximately 3000 Lumens of light. System is compatible with the use of an approved trailing-edge dimmer.